Every so often, the internet takes a break from trolling tech sites and complaining about celebrities to create a beautiful mash-up of movie bits, be it a montage of brilliance, like the 100 greatest movie threats of all time, or a trailer remix that adds new meanings to the same old shots. These bring delight to us all for five minutes on a Friday afternoon – but this year videos such as these faced a threat in the form of anti-piracy measures like the controversial SOPA bill which would have curbed all that creative reworking of films and music by legally lumping it in with full on movie piracy. It's hard to know what actual filmmakers think about you taking their work and making it into something else – real live directors and creators, who put months and years of work into a film before you even hear about it let alone see it. So we asked Edgar Wright, director of Shaun of the Dead, Hot Fuzz and Scott Pilgrim vs. the World, where he stands on the online remix culture that has borne such fruits as Scott Pilgrim vs. the Matrix and the tear-jerking Shaun of the Dead Island. Understandably, he's not exactly in favour of anyone reproducing whole films and making them available online for anyone to watch for free. "There's a weird thing online - people expect to get everything for free and you maybe don't think about the fact that the people who make these things do need to get paid. There are crews that make these films and TV shows and they have families and stuff. It doesn't just happen for free. "People kind of think that they're stealing from a corporation but [individual cast and crew members] all work hard and want to get paid for that," he added. "With that kind of thing, for me it's pretty cut and dry," he told us. "But I don't mind if somebody does a mash up of bits of my films and stuff, I don't mind about that at all. "I think that's really creative when people take something like that. There was that short the other day when somebody had reconstituted Rear Window into one shot – it's amazing. That kind of stuff I think is brilliant. "I think it's as simple as that - there's a big difference between people reconstituting material for art's sake than there is about people just pirating a movie and putting it up online so everybody can watch it for free. There's quite a distinct line there." 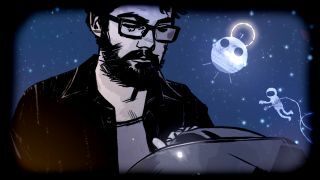 Wright is putting his money where his mouth is by working on Brandon Generator, an interactive, collaborative comic book backed by Microsoft, which allows users to submit ideas and artwork to become part of the story. Perfect for those who fancy honing their creative chops or showing off in front of the man who directed Spaced.